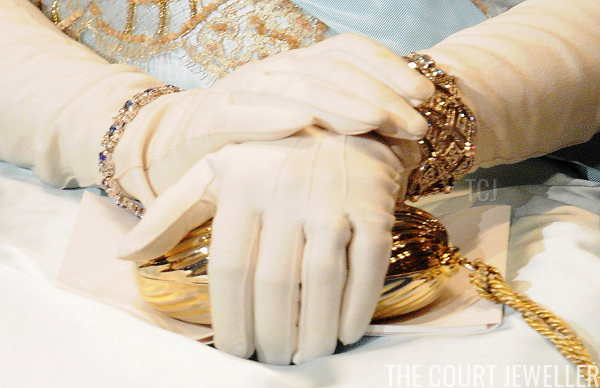 For royal jewelry lovers, the tenth day of December is almost as good as Christmas! That's when the ladies of Sweden's royal family break out some amazing bling for the annual Nobel Prize festivities in Stockholm. As we prepare for next Monday's glitter, here's a look back at the jewels worn a decade ago for the ceremony and banquet. Over the past few years, Queen Silvia has generally rotated two tiaras -- Queen Sofia's Tiara and the Leuchtenberg Sapphire Tiara -- for the Nobel Prize celebrations. But in 2008, she wore another family sparkler: the Connaught Diamond Tiara, which was a favorite of her late mother-in-law, Princess Sibylla. Silvia paired the tiara with one of the most interesting and beautiful suites in the Bernadotte collection: the Russian Pink Topazes. She also wore two bejeweled bracelets: a large diamond bracelet on her left wrist, and a diamond and sapphire bracelet on her right. The combination of the pink and blue gemstones echoed the pink and blue tones of her gown. 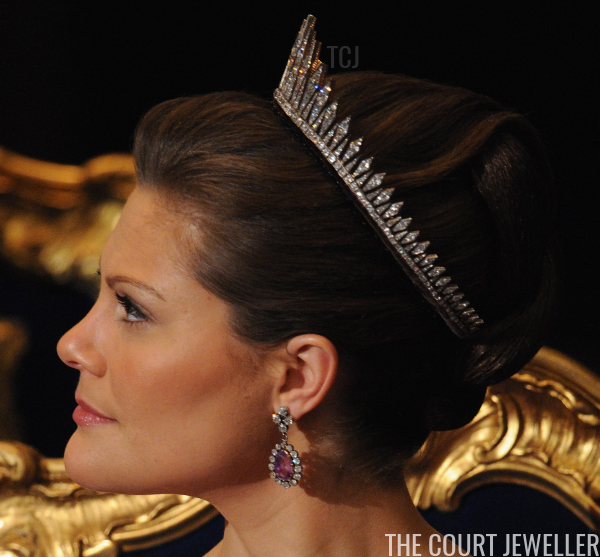 Crown Princess Victoria chose one of her signature pieces, the Baden Fringe Tiara, pairing it with jewels from the family's amethyst parure. 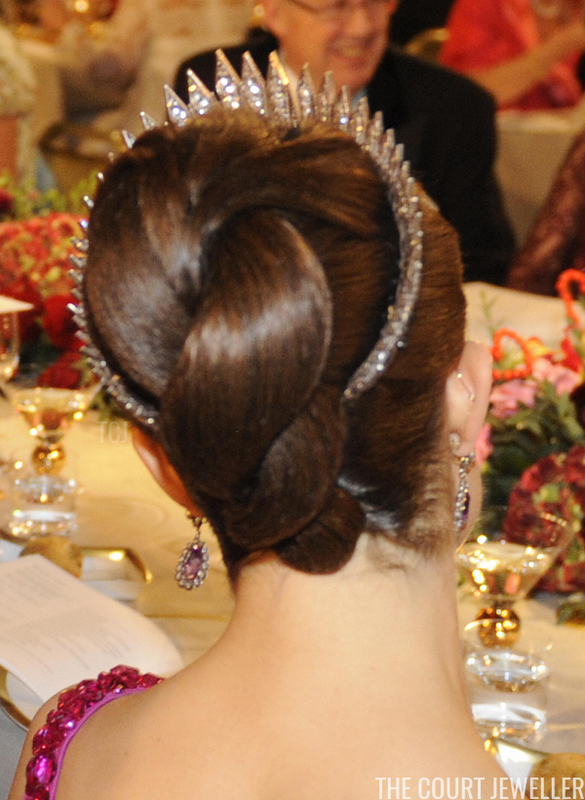 Here's a profile view of the tiara, showing how far it wraps around the wearer's head. Note that, by this time, the velvet wrap on the tiara's base had been changed to match Victoria's hair, rather than the previous gray wrap for Princess Lilian's use. Along with the earrings and brooch, Victoria also wore a diamond and amethyst bracelet from the suite on her right wrist. 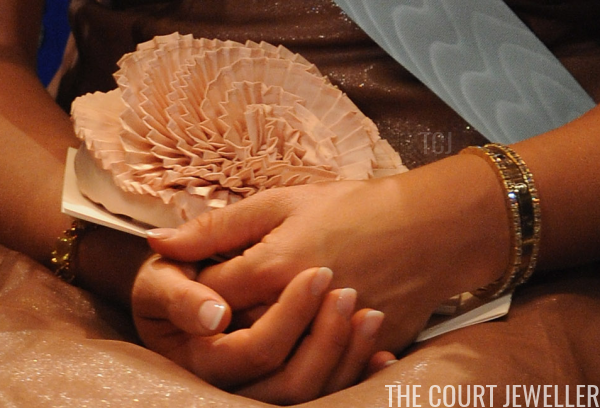 Princess Madeleine wore diamonds and pearls with her blush and brown gala ensemble, including the Modern Fringe Tiara. 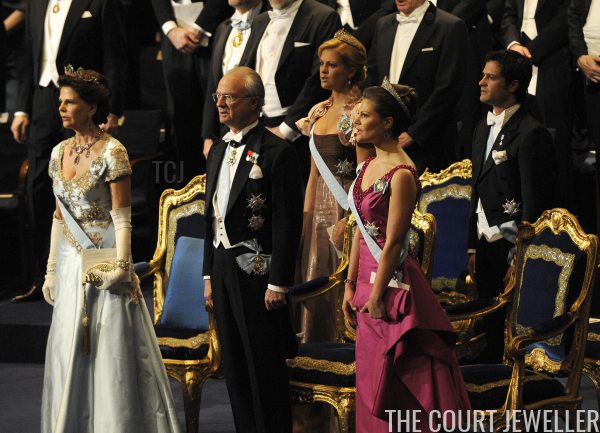 The tiara now belongs to Madeleine, but in 2008, the base of the tiara was still wrapped in dark brown velvet to match Queen Silvia's hair. 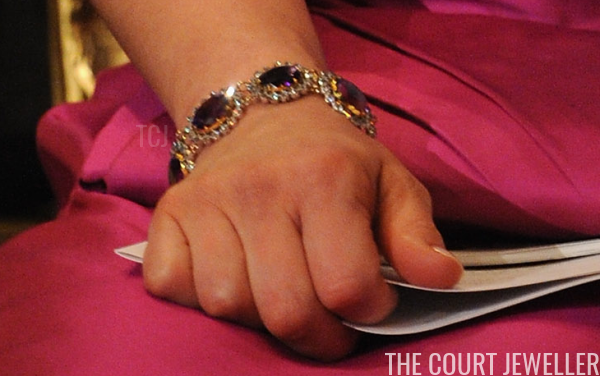 Madeleine also wore jeweled bracelets on each wrist. The king's sister, Princess Christina, rounded out the bejeweled royal group for the ceremony and banquet. She wore her heirloom diamond and pearl tiara (which was later stolen, and has never been recovered) with diamond and pearl jewels, including a modern brooch and a pair of lovely drop earrings. As a bonus, I can also share some of the jewels worn the following evening for the annual King's Dinner for the Nobel recipients! 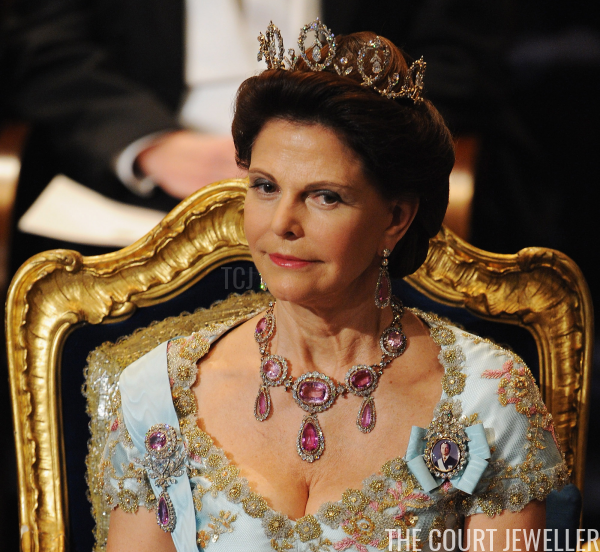 Queen Silvia was decked out in diamonds for the occasion. She wore Queen Sofia's Tiara, as well as the Karl Johan Earrings and the large lozenge-shaped brooch from the family collection. 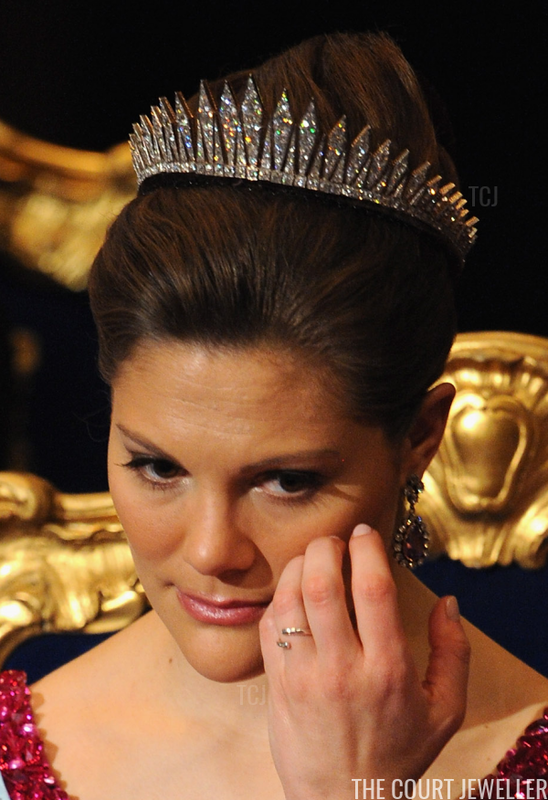 Crown Princess Victoria placed a double row of diamonds in her hair, pairing the rivieres with pearl and diamond jewels. 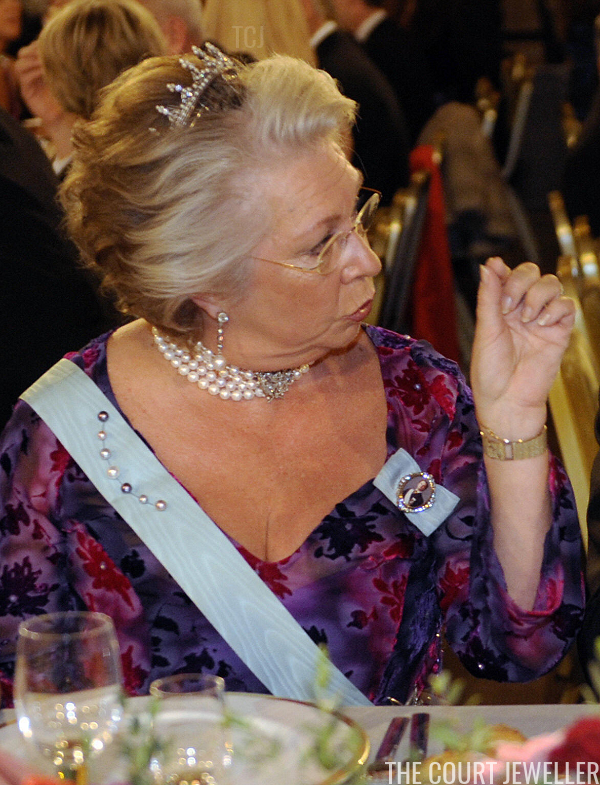 Note that she chose the same pearl drop earrings worn by Madeleine for the previous night's banquet. The double row of pearls is especially significant: they belonged to her grandmother, Princess Sibylla. Princess Madeleine kept her jewelry very simple for the King's Dinner, wearing diamond floral drop earrings that coordinate with the drops on the Connaught Diamond Tiara.